A tempting snack for true gourmets! 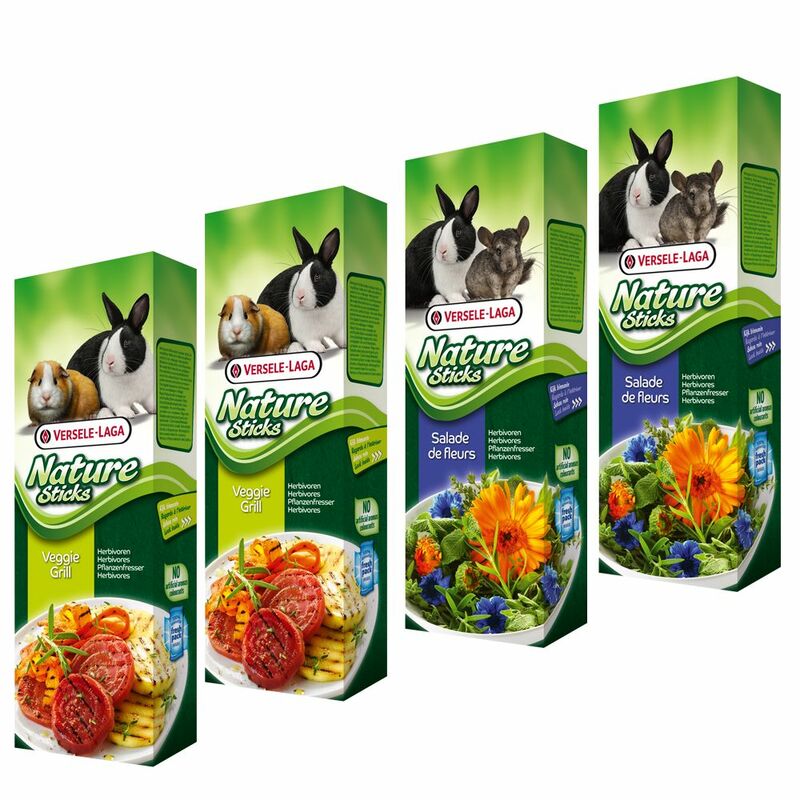 These Nature Sticks for Herbivores from Versele-Laga now comes in a multipack, which is ideal for nature-loving rabbits, guinea pigs and chinchillas. These two tasty, oven-baked varieties are the perfect complement to your small pet's daily meals and is a real treat! Your pet will love the two new flavours – Veggie Grill and Salade de Fleurs – and will be occupied for hours, just nibbling away! The 'Veggie Grill' Nature Sticks combine tasty parsnips with fresh beetroot and carrots. 'Salade de Fleurs' offers a well-balanced mix of marigold, cornflower and various delicious herbs. The highlight? These yummy snacks are free from artificial colourings and scents. Each nibble stick has a 'Magifix' variable hanging clip, so that it can easily be attached anywhere, to any pen or cage. The Nature Sticks for Herbivores Mixed Pack also come in 'Fresh Pack' packaging, which keeps the sticks delightfully fresh and preserves the flavor and crunchy texture until you open the packet. Nature Sticks for Herbivores Mixed Pack at a glance: Supplementary feed for rabbits, guinea pigs and chinchillas Multipack with two delicious flavours: 2 x 2 'Veggie Grill' Sticks, with parsnips, beetroot and carrot 2 x 2 'Salade de Fleurs' Sticks, with marigold, cornflower and various herbs Oven-baked to preserve the natural flavours and valuable nutrients With a 'Magifix' hanging clip: can be fitted on any animal cage or pen 100% natural: Unscented and without added colourings Comes in 'Fresh Pack' packaging.